Tony Horton 10 Minute Trainer is training program based on resistance training. Tony Horton claims that his 10 minute workout can help you lose weight and toned. With the success of P90X, Tony knows what he is talking about. This 10 minute workout is absolutely ideal people who cant spend 1 hour let alone 30 minutes on working out with the busy schedule. We found this workout particular useful for people who wants to keep fit while travelling for work all the time makes next to impossible to keep a regular fitness routine. Simply bring your laptop and press play. 10 minutes and there you go. The program recently featured on Dr. Oz., and you can watch it below. 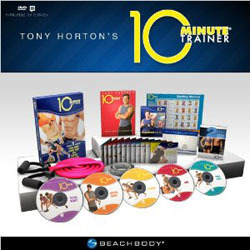 With your help we can reach more people and let them know about Tony Horton 10 Minute Trainer whether this product works or not.